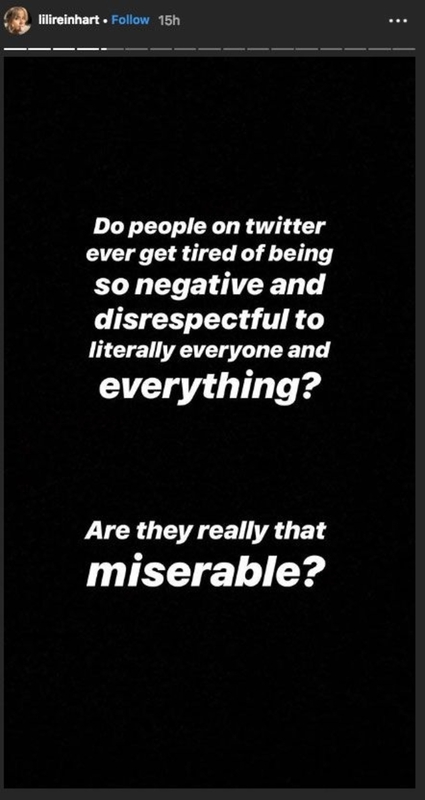 Lili Reinhart recently announced that she's taking a break from the "cesspool" that is Twitter because of the toxic comments and negativity she's faced on the platform. She announced the break via her Instagram Stories. "Do people on Twitter ever get tired of being so negative and disrespectful to literally everyone and everything? Are they really that miserable?" she wrote in the first series of messages. "There's hate everywhere, but especially on Twitter. 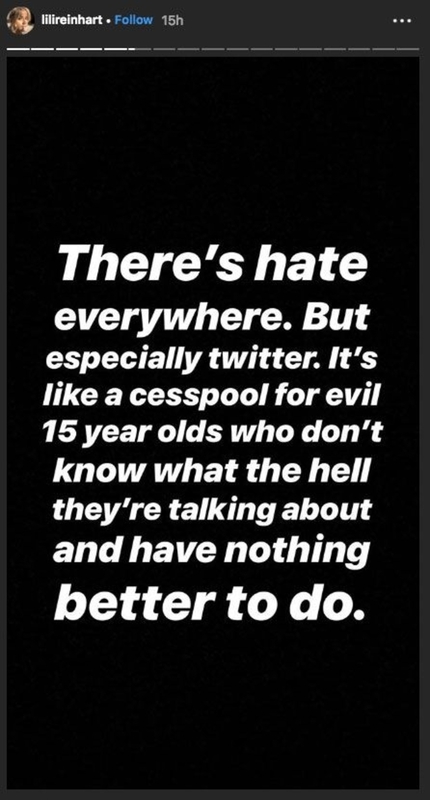 It's like a cesspool for evil 15-year-olds who don't know what the hell they're talking about and have nothing better to do," she continued. 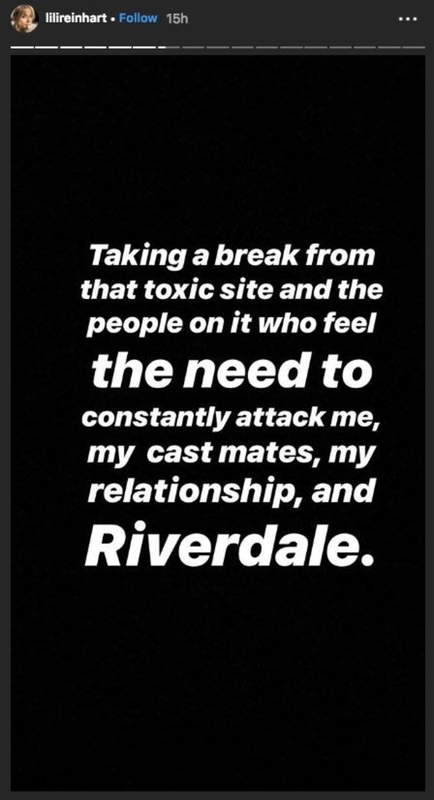 "Taking a break from that toxic site and the people on it who feel the need to constantly attack me, my cast mates, my relationship, and Riverdale." 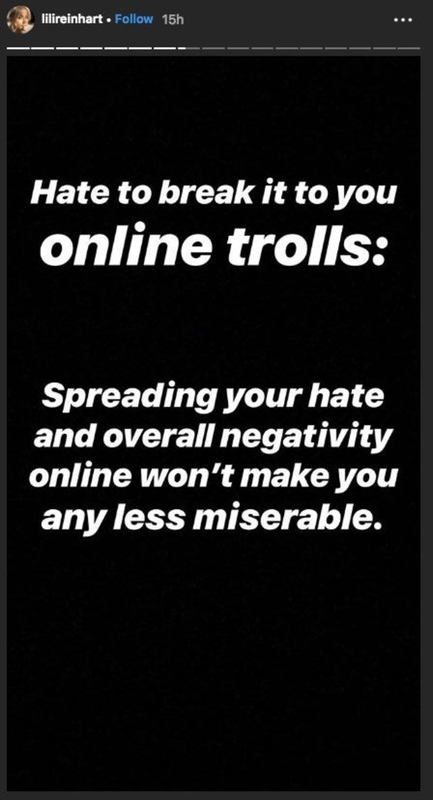 "Hate to break it to you online trolls: Spreading your hate and overall negativity online won't make you any less miserable." Although she doesn't specify what prompted her to take the break, there was some activity this weekend between her cast mates and a hater on Twitter. Elijah Daniel, a YouTuber, tweeted this pretty unnecessary critique of the show. Sums it up nicely, TBH. Lili's break is even less surprising if you recall that in October she jumped to the defense of friend and costar Shannon Purser when people attacked her for kissing Cole's character on the show. She was quick to point out how ridiculous it is to be mean to someone for something another person wrote in a script. So yeah, after all of that you'd probably cash out too if you were her.